Your efforts to fix every issue brought up are commendable; this software is amazingly beautiful (from what I've seen) if somewhat intensive, so good job so far. Without mipmaps you get some aliasing on distant textures when you look along the surface. Anisotropic filtering and even trilinear filtering will not work. This is an ancient bug in ATI drivers, one they somehow didn't fix during the last 10 years! I've been having a lot fewer crashes lately, though I've never been able to get rid of a handful of failures. First up, my system - i7 @ 4.0GHz - 2x GTX580 (3GB VRAM) - 12GB system RAM. Obviously everything should be working great. I've verified I have good drivers and my VB Runtime Libraries are up to date. The first is the obligatory out_of_memory error. I've followed the troubleshooting guide and took special note of the misbehavior of the memory module, so I made sure to set my VRAM percentage to as low as 20%, and run the game in XP compat mode. This has alleviated some of the memory failures, but not all of them. The second is whenever I approach a planet's surface I get the odd gl_invalid_framebuffer_operation_ext error, usually this will hang the program and I have to end the task (it will crash on its own eventually). I turned off mipmaps completely and this appears to have fixed this issue. The third problem is, as mentioned in the other thread, my zero-res planets - I have craters and crater features, but zero mountains or any features whatsoever. The fourth error is a new one and one that is extremely aggravating, I appear to have a complete rendering engine failure. Let me do my best to describe what happened. I zoomed into a world on the planet's surface (in all its zero-resolution glory) and accelerated time to watch the central binary cluster dance around. The engine began madly loading meshes and textures for some reason, a day passed and when the stars rose again I could see the terrain around me was even flatter than usual. I zoomed out from the planet and it was a solid sphere (no craters anymore) with an extremely low-resolution texture on it. The texture started the flicker, the planet disappeared, and reappeared as a flat, white globe. In fact, everything in the universe was now a flat white sphere with zero features. After watching the planet for a bit, everything went dark and suddenly I was teleported back to Sol. This has happened a couple times and there's several errors in the log (pretty much the last 60% of it). It looks like a memory leak or... something. Hmmm... This is a strange issue with the newest hardware. I receive more and more reports with the same bugs. It seems that memory manager works incorrectly with GTX4 - GTX5 series cards. Unfortunately, I can't debug it, because I have an old 9800 GTX used for all my work. Maybe in next version I include printing of additional info in the log that can help me fix this bug, and then I make a hotfix patch. Could that also be the reason I keep getting GL_OUT_OF_MEMORY even though it should only be using a scant 20% of my VRAM (about 600MB)? Try to increase it. Control the usage of virtual memory by process explorer: When it reaches 2 Gb; this is the limit. Look at VRAM usage (you can see it in debug mode, <*> key) and put these value to config (in %). But I'm not sure if this will help. Without mipmaps you get some aliasing on distant textures then you look along the surface. Anisotropy filtering and even trilinear filtering will not work. Yeah, I'm on a nvidia 9400gt though. How do other games cope with this driver bug? They make own mipmap generation routine, or use textures with pre-generated mipmaps (DDX format or so). The last is impossible in SE due to procedural generation of textures. I've already made the first, it works, but with some glitches, so I'm not sure if I will include it in next release. How do I limit the amount of system RAM it uses? You can do it by limiting the video memory usage. Typical value are 800-900 Mb. Set-up the VideoMemoryMaxPercent value to 26% if your VRAM is 3Gb. Then your VRAM useage reaches 800-900 Mb, system RAM usage reaches 2 Gb, and memory manager will start to delete oldest textures/patches from VRAM, leading to deleting supporting resourced from system RAM. I work on fixing these issues. Hey there, I hope I'm right here, I didn't wanted to open a new thread so thats why, I am asking for help here. I have updatet my graphic card (ATI Radeon HD5700) and I have got enough RAM (3326 MB), also my processor is powerfull enough (AMD Phenom 2, X2 550 Processor) but space engine just won't run. Here's the log-file from the "se" file, maybe it is any use to you, I just don't get it, why it won't work. If SpaceEngine launched correctly, try go to some planet and enable procedural stars, plabets etc in F4 menu. Hello everyone. 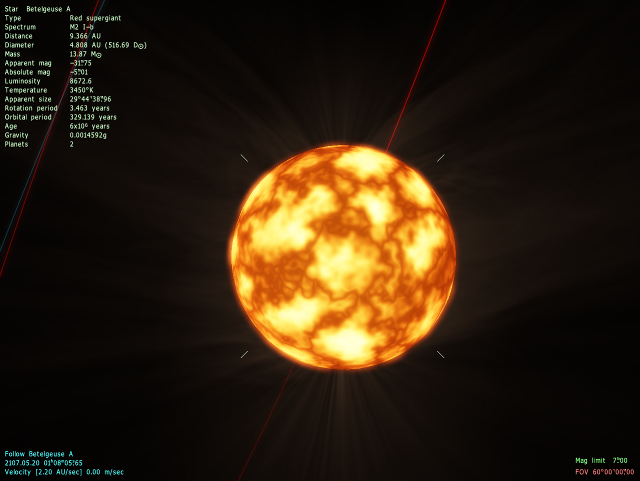 Space Engine working really well for me, but there is one little problem with rendering of Giant Stars. I've seen some pictures from other people, and for example Betelgeuse looks like giant blobby thing, but on my computer is somewhat different - perfect yellow ball. I've attached picture and log, maybe someone can help me. That's a problem? You have no 3D "terrain" on red giants? Yes, that's what I mean. The planets have beautiful mountains and craters, but the stars are flat like a wall. I enjoy this program for only two days, and not really know if it is a problem, if this is how it should be. I saw the pictures on the internet, and the only difference is these stars and I would like to know if you can do something about it. Besides sincerely congratulate the programming skills, a really great program and great fun. I love it.